Scholarly communication is the system through which research and other scholarly writings and knowledge are created, evaluated for quality, disseminated to the scholarly community, and preserved for future use. The UCSB Library is committed to partnering with faculty to address the challenges and seize the opportunities presented by the transformative changes currently underway in scholarly communication. Although university libraries have been increasingly challenged by the unsustainable business models practiced by some publishers of scholarly information, new opportunities for sustainable, peer-reviewed, open-access publishing are developing rapidly, providing faculty the possibility of expanding the impact and visibility of their work by reaching new worldwide audiences. On these pages you will find information about these new alternatives, including services created and provided by UC for data curation, preservation, and open-access publishing. Also available on this site are resources and tools to assist faculty in understanding and managing their copyrights, a process that is key to reshaping scholarly communication and maximizing the impact of new knowledge. 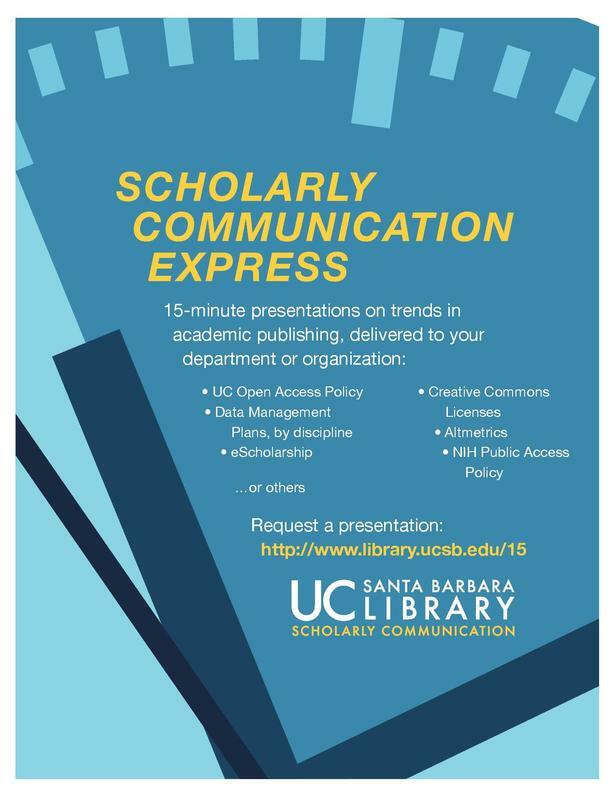 While faculty must play a central role in changing the scholarly communication system, the UCSB Library stands as a ready partner in furthering this complex but exciting task.